Anyone who has spent a fair number of years working in Corporate London has, at least once, been dragged to a team building workshop. Usually having to do with the squeezing of spongy balls or watching boring presentations that lead to equally boring questionnaires, the only upside to these tedious exercises is that it allows the attendee to get away from their desk for a few hours. Enter Luke Crookes. 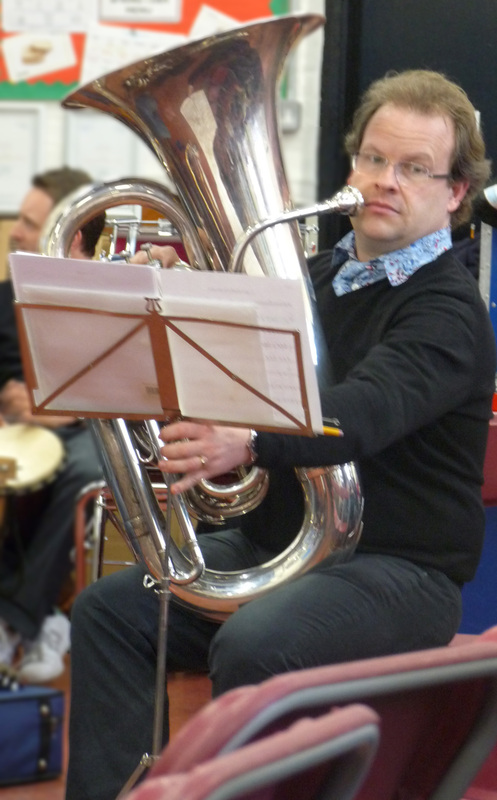 An accomplished Bassoon player, Crookes decided to use his social skills and musical knowledge to create ‘Musicing’, a team building company which promises that at the end of a workshop, the attendees – no matter how novice – will be able to play a musical instrument with their colleagues in a full orchestra. Skeptical? So was I. So I decided to give Musicing a try. On a Sunday afternoon, along with about 60 others, I attended Musicing’s pilot workshop. The attendees were asked to choose from a compelling array of instruments including the clarinet, violin, viola, guitar, a variety of brass and percussion instruments, vocals and best of all, the cello. I’ve always loved the sound of a cello, but had never touched one. I found myself excited by the prospect of producing even one solid note from the hour glass shaped wooden instrument that one of Crookes’ staff members handed to me. With its glossy façade and weighty presence, I cradled it as if it were a newborn baby. What’s great about a cello is that the sounds produced by its strings when stroked with a bow are so deliciously rich that one need not play well to sound interesting. Still, playing as a group is a different thing entirely, and the job of every team builder is to get a group of people to create something vital together. Crookes was on it. The mission never alluded him, but the cleverness that he brought to this particular team building venture, which will perhaps deem his methods as more viable than normal exercises, turned out to be two important aspects. First, Crookes maintained throughout the entire exercise that each of us brings something unique to the table. Not a new concept, yet surprisingly effective when someone gives you the freedom to explore that possibility. The staff members in charge of the cello players asked us to play with our eyes closed for a few moments. We had been told what to do, but would not be able to see the hand signals that alerted us to the next step. But this faith in our group caused an interesting shift in perspective and a measure of trust in our fellow novices that had a pleasant result. It caused us to listen to the other players to determine the next step – surely the point of any team building exercise. Crookes reinforced this idea, at the end of the session, when we all jammed together and basically tried to add something to the ongoing rhythm that reverberated around us. The second aspect of Crookes method that caused this experience to be unique is that though most of us were playing a particular instrument for the first time in our lives, there was never a moment during the exercise when we weren’t taken seriously. We were entrusted with beautiful, and likely expensive, instruments. We were given clear instructions about how to hold the instrument and play it properly. 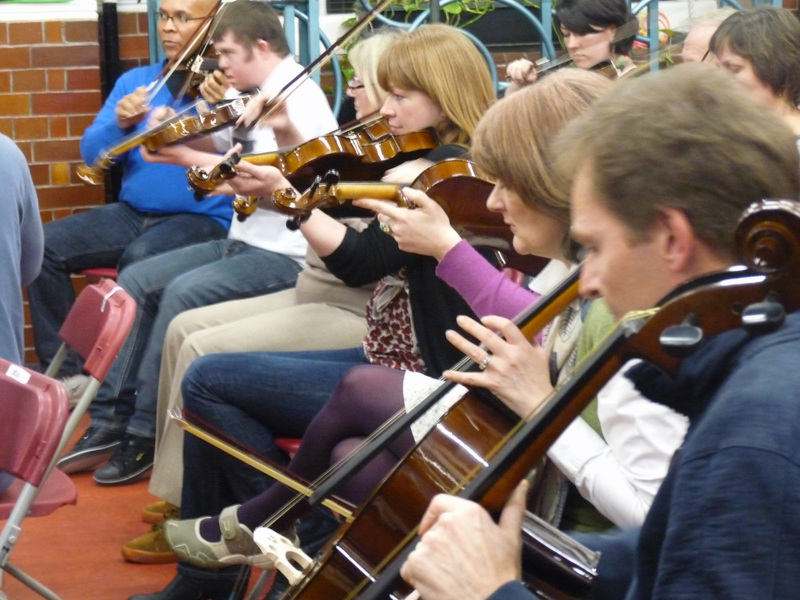 Each section of the orchestra was treated as a vital part of the whole. 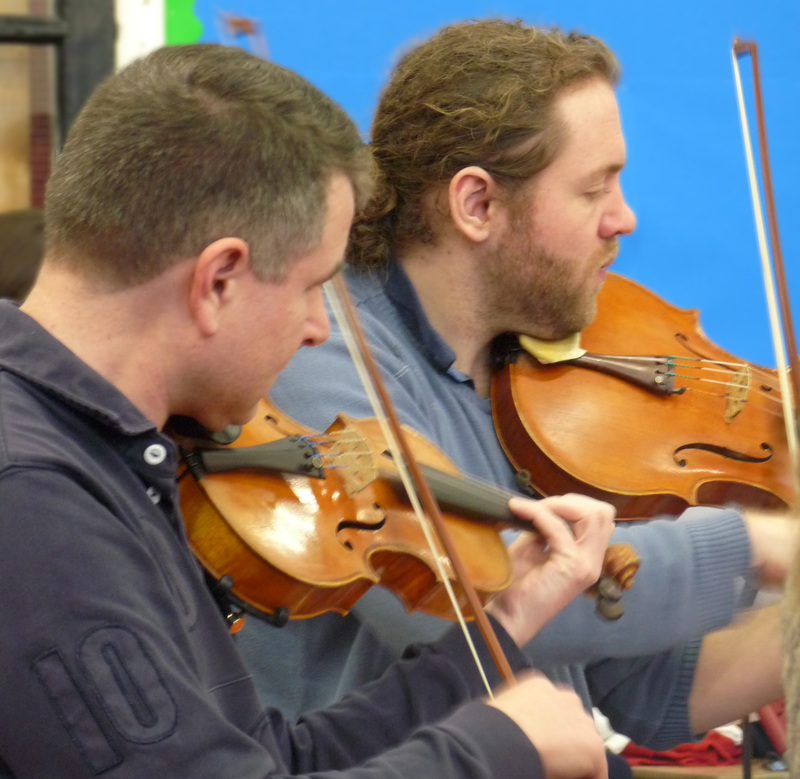 But most importantly, there were more than 20 staff members, actual orchestral players, who instructed us and played alongside us during the entire exercise. This more than anything caused me to take my part very seriously. And the better I played, the more focused I felt. A staff member, who instructed the violinists, somewhat firmly pushed us to do better as if she expected that we could. When it was over, I walked out of the venue feeling confident. As cliche as that may sound, it is ultimately logical once we factor in an inevitable truth: I left my house that morning barely aware of how to properly hold an instrument. But by the time I returned, I had played the cello with an entire orchestra. And although it is a sure bet that my playing was rubbish, I can now imagine taking lessons and one day giving myself countless hours of pleasure by playing regularly in the comfort of my own home. The bigger picture for Musicing is that it’s recipients will likely feel creative drive and purpose with their fellow work colleagues. It is not so farfetched to envision a group of employees from the Reporting team of a major corporation getting a natural boost by having an orchestral jam with the Risk and Assessment team. It sort of put things in perspective when you’ve created something you can be proud of. It will be interesting to see how many companies will be willing to take the leap. Although the past two decades has seen an increased interest in tapping into the creative or right hemisphere side of the brain, left hemisphere functions such as problem solving and language are still very much lauded in a corporate environment. Still, there is a rising need for creativity through teamwork in order to come up with innovative ways to solve problems and to keep up with technological advancements. This is where a team building method like Musicing has the potential to make a difference in corporate environments. In the consistent atmosphere of mergers and lay-offs, and the poor economy, there is little opportunity for feelings of accomplishment in corporations. Musicing may be a welcome respite and a useful learning tool for companies wishing to increase morale and stimulate teamwork. In a place alive with the faith of worshipers, where stone walls and wooden pews reign supreme, a small ensemble of musicians play beneath a stunning glass window. A bass player caresses his instrument like a man in love. The nimble fingers of a pianist dance across the keys like a card shark hiding the magic number. A woman enters in a white, sleeveless summer frock that fits her slender physique like a glove. She seems a tennis pro, who suddenly decided to put down her racket in exchange for a microphone. When she sings, her voice is smooth and sultry, and tells her story. Her name is Lizzie Ball. Before long, she switches instruments – from voice to violin, from violin back to voice back to violin again. All eyes in the crowd are on her. And while this humbling scene is one the audience might expect to see again and again, they would be wise to always imagine Ball at the centre. There is an air about her that fills the room. She is magnetic, immensely talented and down to earth. One of Ball’s greatest mentors is Nigel Kennedy, who recently chose her to head his Orchestra of Life. When Ball was ten, her mother took her to see the well known Kennedy in her local town of Sheffield. Ball was rooted to her seat. About 15 years later, she met Kennedy at Ronnie Scott’s and decided to tell him how much he meant to her as a role model. Kennedy and his wife eventually developed a friendship with Ball and asked her to fulfil the role of leader of the Orchestra of Life, a musical ensemble which Kennedy put together earlier this year. No one ever pushed Ball into becoming a violinist. It’s something she wanted from the age of seven. 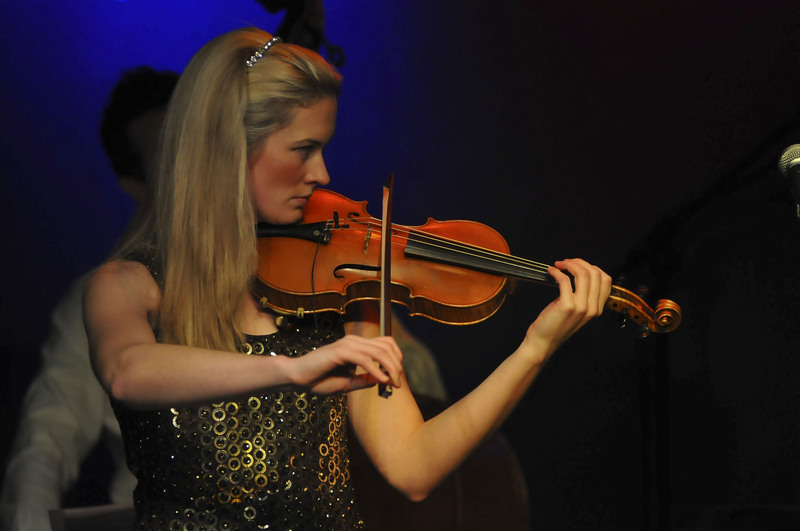 After obtaining a music degree from Cambridge, she began making a living by playing the violin. During a jam session, one night, with friends, Ball began to sing accompanied by a guitar. Everyone was surprised at her natural ability and urged her to pursue it. Ball’s father is a jazz pianist, so she grew up listening to Herbie Hancock, Julian Joseph, Ella Fitzgerald and other greats, which explains in part, why the classical violinist has gravitated so strongly toward jazz. The vocalist also attributes her love of jazz to her mother’s eclectic taste in music and the fact that they lived near Sheffield during a time when the town was ripe with Northern bands. Playing in various bands from quite a young age, Ball performed with orchestra members and also joined them when they played in their own bands. Ball’s eclectic background caused her to eventually create a band of her own. The Lizzie Ball Band is made up of a skilled and diverse group of colleagues from Ball’s classical background and regular performers at Ronnie Scotts, including jazz guitarist Nick Meier, pianist James Pearson, drummer Chris Dagley, percussionist James Turner, and double bass players Rory Dempsey and Sam Burgess. Ball believes that it’s important to stay positive and to engage in activities that improves one’s outlook on life. The artist works in projects designed to help stigmatised children channel their energies in a healthy and rewarding way. 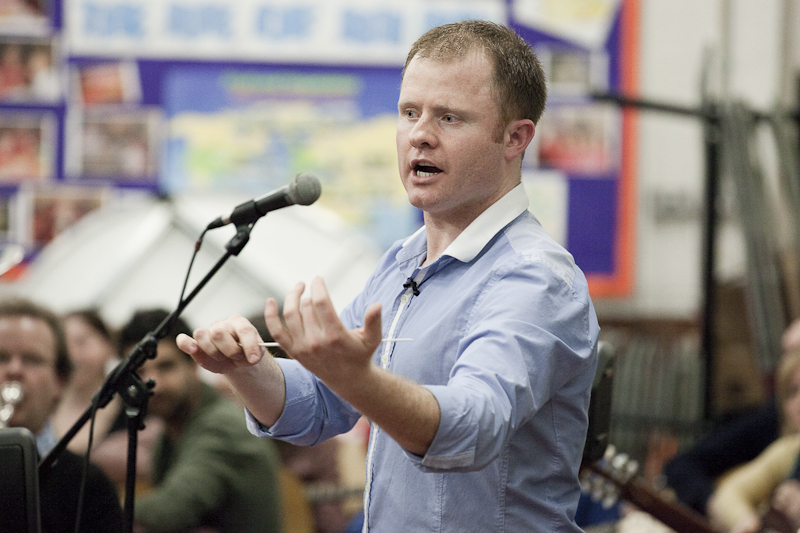 One of them, Britten Sinfonia’s project, sponsors a live gig in which the children perform. The young students also get the opportunity to work with Ball and other artists on music projects, improving their self-confidence. Self-confidence is an important aspect to being an artist, according to Ball. The violinist warns against self-deprecation, which she often feels is present in England. 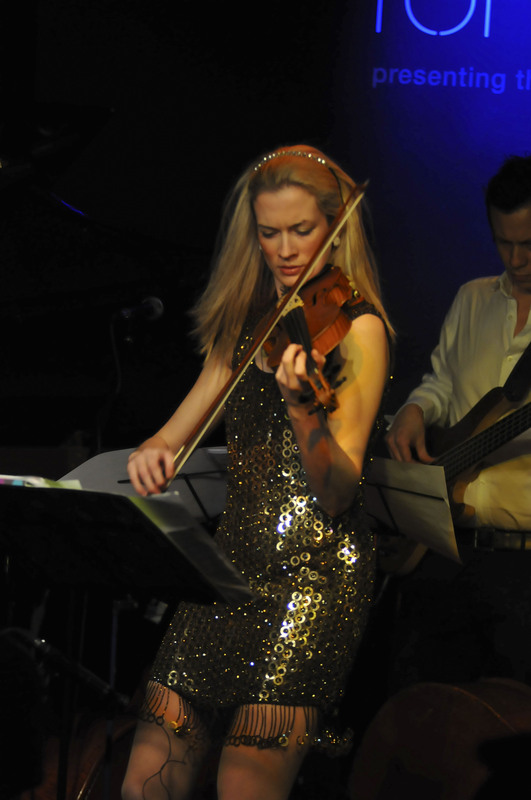 As a violinist, vocalist, and leader of a band and an orchestra – music seems to permeate every aspect of Lizzie Ball’s life. Yet, this seems as much a labour of love for the artist as it is a career. With incredible focus and self-discipline, she continues to embrace the world of music she was introduced to in her childhood. Music lovers would be wise to watch out for Ball over the next couple of years. Her dynamic personality and unwavering passion has already secured her status as a principal player in the genres of jazz and classical music. Lizzie Ball will be performing Bachs Chaconne for solo violin with 4 vocal part accompaniment with New York Polyphony in Oslo Cathedral on August 7th at 7 30pm. She will also be performing with the Urban Soul Orchestra in London and the South of France on the 2nd, 4th, 20th, and the 27th through the 29th of August.